This weekend I had lunch in a strange land — four miles from my house! Friends of ours contacted us earlier in the week to see if we would be interested in picking up their CSA box at a local farmer’s market on Sunday as they would be out of town. Free veggies?? Sure! Who wouldn’t be up for that? For those not familiar with CSA, it stands for Community Supported Agriculture. Basically you buy a “share” of a local farm’s produce and each week you pick up a box filled with whatever is ripe for the picking that week. This particular farmer’s market was in Logan Square. Oddly enough, a place that neither me nor my husband remember ever stepping foot in or driving through… even though it is only four miles from the house. So off we went on our little veggie-gathering adventure. We took familiar streets but stayed on them longer than we normally do. What we came across was this absolutely charming and very foreign-feeling neighborhood. Big wide boulevards led to an adorable center square complete with monument. It was on the square that the farmer’s market was set up. After collecting our vegetable box we decided to take a look around this strange land. We found a great Italian place with outdoor seating for lunch and while sitting there watching the “locals” walk by, we both agreed that it felt like we were on vacation in some foreign city. We passed a Hispanic 7th Day Adventist Church and a Norwegian Lutheran Church within a block of each other. We heard many different languages being spoken as we sipped our wine and ate our pizza. But my favorite oddity of the day: a woman walking down the street with a friend, smoking a cigarette. On the hand holding the cigarette she wore a rubber glove. The other hand did not. What do you think that was about? Gotta love Chicago! So next time you need to get away from it all and feel like a vacation — try taking an everyday street just a bit further than you normally do. You’ll never know what you’ll find! Who doesn’t like a good Chinese chicken salad? I know I do. This one’s name may sound like hype, but trust me – it’s true. This honestly is the Best-Ever Chinese Chicken Salad! I know I’ve loved this particular recipe and realize that I’ve been making it for quite some time. I had no idea till I looked at the recipe that I had cut it out way back in 2006. It is sensational and remains in very high rotation on my menus. That is quite a feat in itself since I tend to tire of things and purge recipes that start looking a bit rough around the edges. But I don’t think I’ll ever get rid of this one. It is one of the few salads that I crave. 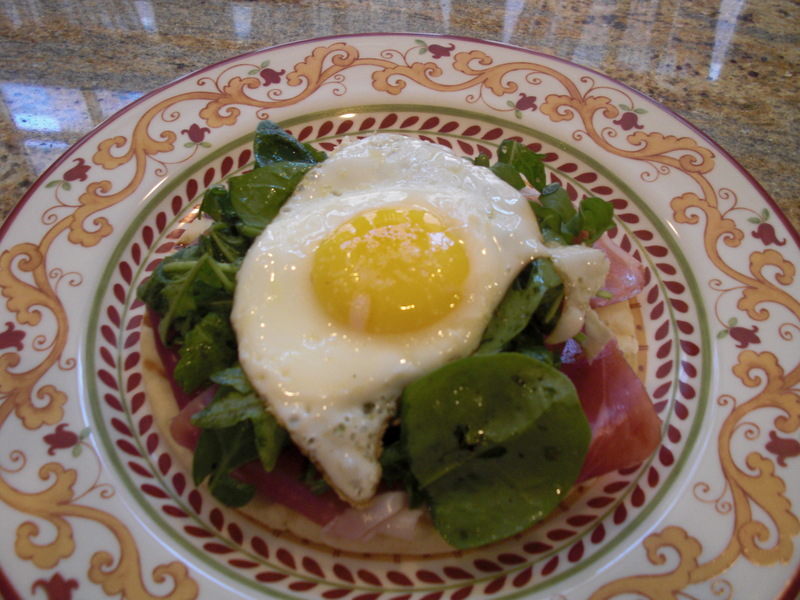 The recipe came from Sunset Magazine and I have made a few tweaks here and there which I have noted in the recipe. My alterations make it a bit quicker and easier to prepare, and therefore a snap to whip up whenever the craving strikes… as it did this week. Enjoy! In a medium bowl, whisk together 2 tablespoons rice wine vinegar, 2 tablespoons brown sugar, 1-1/2 tablespoons soy sauce, 1 tablespoon Asian red chile sauce (such as Sriracha), and 1-1/2 teaspoons grated fresh ginger. Slowly drizzle in 1/4 cup vegetable oil or grapeseed oil, whisking constantly. Season with salt to taste. 1. In a 2- to 3-quart pan over high heat, bring about 1 quart water to a boil. Add asparagus and cook until crisp-tender, 2 to 3 minutes. Drain, then plunge asparagus into ice water to stop the cooking. Drain and set aside. In a large serving bowl, toss the cabbage, chicken, and asparagus with the dressing. 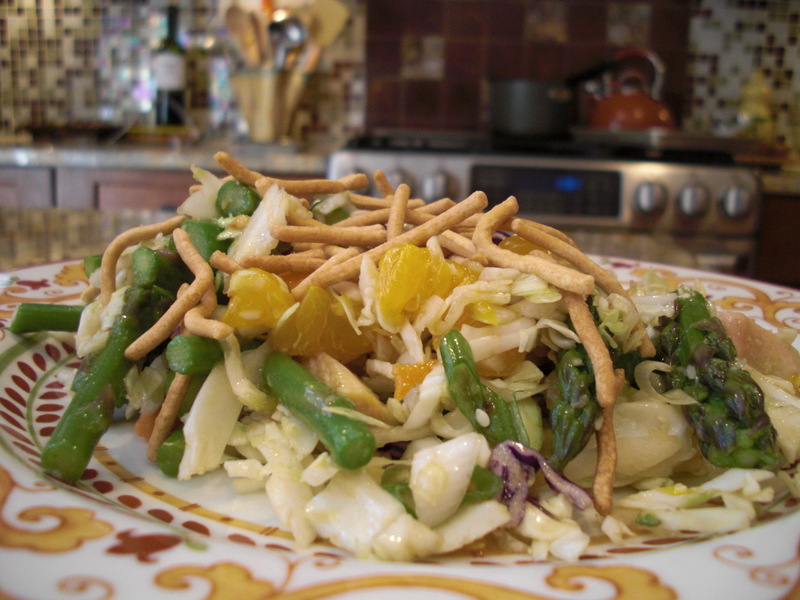 Top with avocado, oranges, and chow mein noodles, then garnish with green onions and sesame seeds. 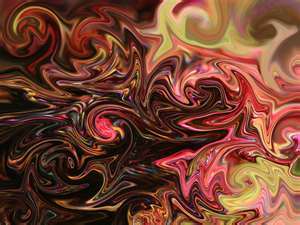 There comes a time when the only thing left to do is to shake things up a bit. Which reminds me of my favorite quote: “There comes a time in every woman’s life, when the only thing that helps is a glass of Champagne,” by Bette Davis. But I digress. Back to shaking things up. I think it’s healthy. It works out the kinks. It lets you see things in a different way. Yep, things are definitely getting shook up a bit around here and I think that’s good. I recently began working part-time with a really interesting company here in Chicago. This place is doing real, down and dirty market research. Well, actually, they are facilitators for all sorts of companies and industries to do down-and-dirty research. It’s not at all what I am used to having always been on the rather hoity-toity public relations side of things. Here we are talking about taste tests, focus panels, research groups, media trial runs, etc. And you know what? I dig it. Now for someone who likes to plan and schedule every aspect of my day, this new additional job means making adjustments. First of all, the hours. Crazy unpredictable. Sometimes I’m in first thing in the morning, other times I don’t head in until late afternoon and work late into the night. For a planner, that takes some getting used to. But I am, and again..I’m digging it. It’s totally different. Viva la difference! The other thing is every day is different. Unique. I never know who the client is going to be and what it’s going to be about until I get there. Having spent so many years of my life cultivating my own clients and basically knowing what needs to be done day in and day out…this is a breath of fresh air. And the truly amazing thing I’m finding is that while this is definitely screwing with my routine and adding more to my plate, I’m actually getting more stuff done on a daily basis! The more I have to do, the more I find I actually do! Imagine that! Besides, all this chaos in my life just gives me more lists to make! I do love me a good list as I’ve mentioned many, many times before. Lists rule! This was a busy week which, I’m sure in time, will spawn more non-food-related blog posts. However to avoid further tardiness, I present this week’s Weekly Winner. Grilled Salmon with Walnut-Arugula Pesto. Generally, I am not a big fan of pesto. I’m not sure why as I adore basil, garlic, pine nuts and sauces in general. But it’s true. I am not Pro Pesto. This recipe however, was a bit different and therefore intrigued me. The pesto was made with an arugula and basil combination and used walnuts in place of pine nuts. I dug it. I hope you will too. The recipe came from Fine Cooking Magazine which I usually devour within the first 12 hours of landing on my doorstep. 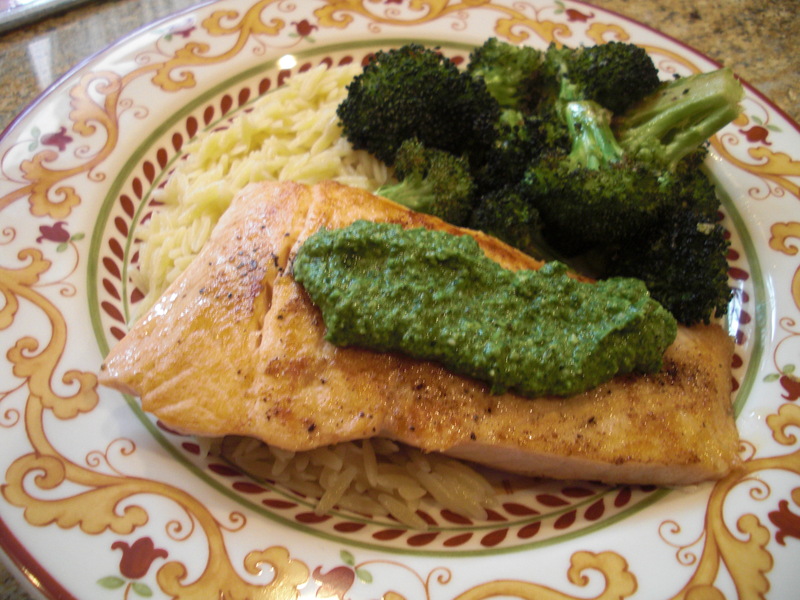 It’s really just a recipe for the pesto, as the salmon is simply grilled. But that’s how I like my salmon …. simple, with just a little bling. In this case — a verdant green dollop of pesto. Enjoy. Heat a lightly oiled grill pan over medium-high heat. Rub the salmon fillets all over with the remaining 1 Tbs. oil. Sprinkle all over with 1/2 tsp. salt and 1/4 tsp. pepper. Put the fillets on the grill pan, skinned side up, and cook until well marked, about 5 minutes. Flip and continue to cook until opaque in the center, about 5 minutes more. Serve with the pesto.